The part of the meadow immediately around our house is filled with Common Milkweed, Asclepias syriaca. I don’t think I’ve ever seen such a large patch of milkweed before. Ordinarily I would find single plants, maybe a few loosely clustered together, but I’d never found any area where they were the dominant wildflower. They’re a plant, like lilacs in the spring, that I love to walk among because of the heady sweet fragrance that rises from their blossoms. Such an incredibly large patch gives off an incredibly delightful scent. The smell is likely a byproduct of the plant’s nectar-rich flowers, which have an unusually high proportion of sugar in their nectar. Native Americans would actually use it as a sweetener, like honey, though I can’t imagine how painstaking it must have been to harvest. 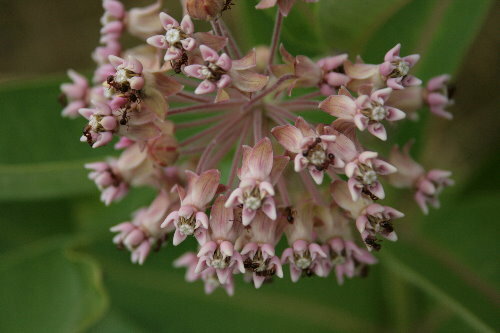 There are more than 140 species in the genus Asclepias, the milkweeds. Around here we only have a handful, of which the Common Milkweed is probably the most common and well-known. 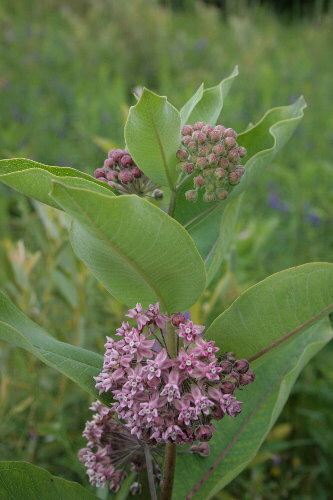 Others include Swamp Milkweed, A. incarnata, and Butterfly Weed, A. tuberosa. Butterfly Weed isn’t that common, but it’s certainly eye-catching, with vibrant bright-orange flowers that, as the name implies, are especially attractive to butterflies and other insects. Asclepias are also known as Butterfly Flower and many cultivars can be commonly found in nurseries and garden centres. 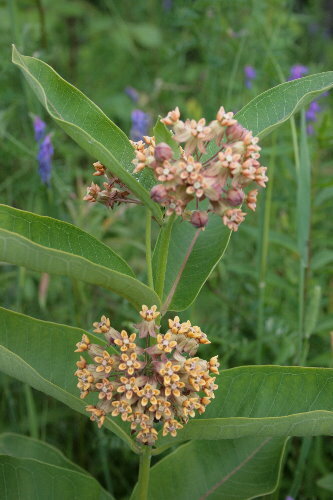 The name milkweed, of course, comes from the white sap that oozes from the plant’s veins when its leaves or stem are broken. The sap contains a type of latex, similar to that collected from rubber trees, but for which attempts to process it have been largely unsuccessful. The actual function the latex serves to the plant is still up for debate, although it may be either an additional defense against predators due to its bitter nature, or possibly a coagulating agent in cases of wounds. Anyone who has broken a milkweed leaf knows how sticky the sap is. The plant can also be harvested for silk fiber, which is taken from the downy seed puffs in the fall and winter, as well as bast fiber, which is the stringy inner “bark” of the plant. The latter much resembles hemp in its properties and uses. Interestingly, oil from the seeds can be converted and used as a very effective sunscreen. Even though at maturity the plant is toxic and could make you ill if eaten, these toxins are found in minimal quantities when the plant is young, and can be destroyed through cooking, allowing young leaves and sprouts to be consumed. 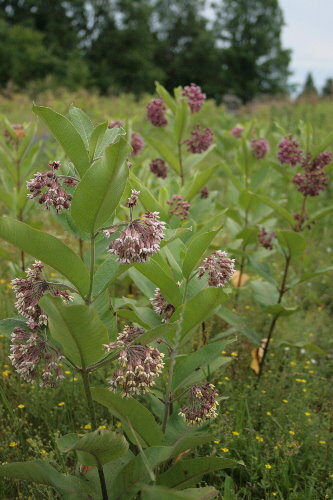 The vast majority of Common Milkweed flowers are purple – either a dark purple, as in the previous photo, or a lighter purple as shown in the foreground of the second photo. However, while out walking with Raven one afternoon I came across three plants, all clustered together, that had peachy-orange flowers. I can’t find any mention of this unusual colour online. At first I just assumed they were older, but they were still in good shape, and fading flowers typically go yellowish-white, rather than peachy-orange. I’d be curious to know if anyone else has observed this colour morph. I suspect that milkweed is probably best known for its role as a host plant for monarch butterfly caterpillars. I have seen a few monarchs in our patch this summer, but I’m not sure whether the rain has affected numbers or they’re just not as common around here, as there haven’t been nearly as many as I would expect for a patch this size. I’ve been watching for caterpillars, but haven’t spotted any yet. Monarchs aren’t the only insect that milkweed appeals to. Ants are attracted to the sweet nectar of the flowers, and many of the plants I looked at had ants crawling all over their flowers. 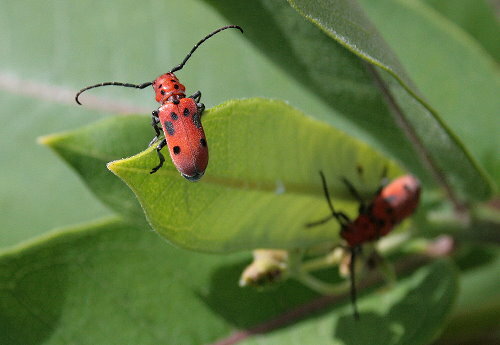 These Red Milkweed Beetles, Tetraopes tetrophthalmus were recently emerged and crawling about the milkweed plants. They were fairly abundant, with many plants hiding at least a couple. Classified with the long-horned beetles, this species uses the milkweed as a host plant, much like the monarchs. Their larvae bore into the stems of the plant, feeding on the plant tissue there, and then overwinter in the roots. They emerge as adults in the early summer to mate and lay eggs. These two, and many of the others I saw, may have been crawling around looking for a mate. Most species that feed on the plants as larvae end up being either toxic or distasteful (or both) to potential predators, and sport bright warning (aposomatic) colouration. In the case of these beetles, it’s a bright red with black spots. 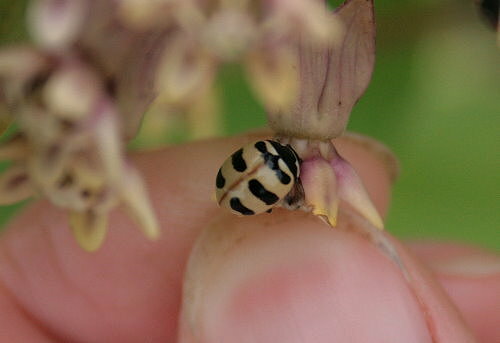 This one is an Orange-spotted Lady Beetle, Brachiacantha ursina, a native species that is often associated with milkweed. I’m not sure whether its larvae likewise use it as a host plant, or if the adults are there for another reason. I saw several of these guys on the plants when I poked around looking to see what I could find. 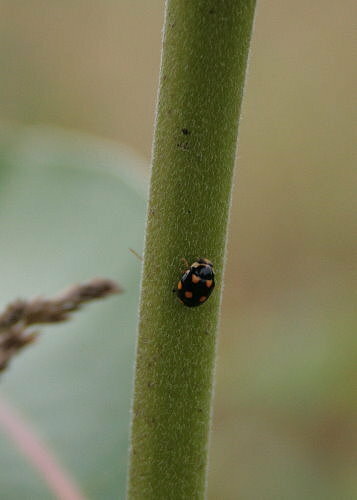 This final species is Three-banded Lady Beetle, Coccinella trifasciata, another native. There appear to be two subspecies, one that occurs across most of the continent east of the Rockies (C. t. perplexa), and the other that is found west of the Rockies, along the coast. The Large Milkweed Bug, Oncopeltus fasciatus, is another species I’ve recently been seeing a number of on the plants, but for whatever reason I don’t seem to have taken a photo of them at any point. Nice lady beetles. I haven’t seen either one of them in my area or West Virginia. Our Milkweed is all spent now and I pulled it up. Absolutely LOVE milkweed! The fragrance is so heavy and sweet. Every year, when the blossom heads open, I rush to smell their intoxicating scent! What a beautiful perfume essence. And they are home to milkweed bugs and spiders and monarch caterpillars. My neighbor told me how as a boy he would gather the milkweed seed pods as they were used to stuff life jackets back in the 1930s and 40s! They would get paid by the bushel. Such a plant. Wonderful post! Thank you. I really enjoyed this post. Interesting info about the milkweed seed oil and sunscreen. I am going to plant milkweed seed in my butterfly/hummingbird garden this fall – I am so excited! I love the Three-banded Lady Beetle! I don’t know if I’ll ever see one where I live, but I’ll be looking. Thank you for this post! 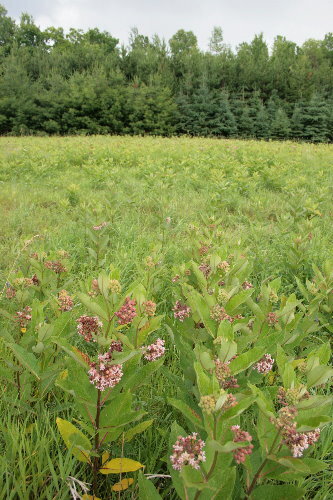 Milkweed doesn’t grow where I live now, but when I was in Pennsylvania there was a huge field of it on overgrown parts of the farm where I lived. These pictures immediately conjured memories of fragrance, and butterflies. I really enjoy your site – the information and especially the pictures.